Stay in your kitchen: Sometimes you go into autopilot when you’re cooking. And when your toddler begins to cry or someone rings the doorbell, it’s easy to forget about leaving your water to boil or the fry pan to heat up. This can lead to disaster. If your stovetop is turned on, you should stay aware. If for any reason you need to leave your kitchen, always turn your stovetop off to avoid the possibility of fire while you’re away. Watch your oil: Many recipes recommend heating up oil prior to adding meat or vegetables to your pot or pan. But even oils have their temperature limits. A small splatter can lead to a big fire. Be sure to use a grease guard or a lid whenever you’re heating up oil. If an oil fire starts, turn off the stovetop and quickly cover your pot or pan with a lid to smother the flames. Clear the area: From oven mitts to potholders to plastic cooking ware, we often create a mess when we’re cooking. Sometimes we place things too close to our stovetop and they can ignite. Make sure you keep your stovetop clear of everything but your pots and pans. Even spoon holders often kept at the center of the stovetop should be moved to the countertop. 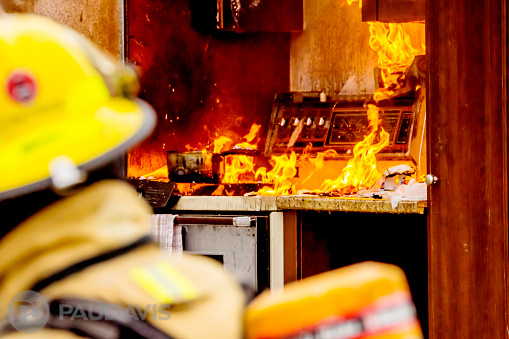 Have a fire extinguisher handy: If the worst should happen and a fire breaks out on your stovetop, be prepared. Have an ABC fire extinguisher ready in your kitchen. This type of extinguisher can be used on grease fires, a common type of kitchen fire. If your home is damaged by fire, it is critical to contact a company that specializes in the fire and smoke restoration process as soon as possible to prevent further damage. Paul Davis understands that the aftermath of a fire can be devastating for you and your family. That’s why we’re a preferred resource to help restore homes and businesses back to normal. Anytime fire damage takes place, This Is No Time For Second Best™.